Per Elliotte Friedman and Bob McKenzie, the Pittsburgh Penguins have inked college defenseman Ethan Prow to a two year entry level contract that will kick in next year. For now, however, Prow will report to the AHL's Wilkes-Barre/Scranton Penguins on an Amateur Try Out (ATO) deal. This will be the season's first college free agent signing. From 2012 to 2016, Ethan Prow attended St. Cloud State. He is a right-handed defenseman and falls under the category of what is colloquially known as a "puck-moving" defenseman. More so, he has a shot that can only be referred to as "lethal". 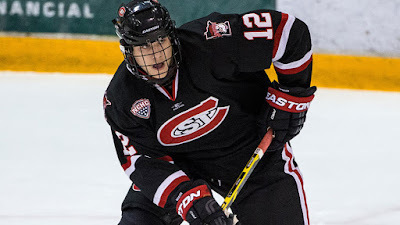 The 23 year old Prow, weighing in at 185 pounds and 6 feet tall, was the NCAA's top scoring defenseman this season, with 38 points in only 37 games played. He set career highs in goals (8), assists (30), points (38), and plus-minus (+28). He averaged 1.027 points per game - as a defenseman! Due to this (and his stellar play, of course), he is a finalist for the Hobey Baker Award, the NCHC player of the year, the defenseman of the year and the offensive defenseman of the year. As he reports to the Wilkes-Barre/Scranton Penguins, he will be joining a D-core consisting of Niclas Andersen, Steve Oleksy, Barry Goers, Will O'Neill, Harrison Ruopp, Tim Erixon, Reid McNeill and Ryan Parent. What Derrick Pouliot did for the Wilkes-Barre/Penguins in his stay there, Prow will likely do the same (albeit in a decreased role due to his lack of experience at the AHL level). Best case scenario, Prow creates the situation where the Penguins may not be in a scenario where retaining the services of Justin Schultz is absolutely necessary (this is not an insult to Schultz, mind you). This is an amazing get for the Pittsburgh Penguins, and kudos to Jim Rutherford and co. for snatching him up from free agency.